If you travel you’re going to end up spending a lot of time in airports. And if you spend a lot of time in airports, you’re going to spend a lot of time sitting around. And once you’re done with that, you’ll hopefully start taking a look around at the shops, the restaurants, the views out the window and the often truly creative amenities designed to make your dwell time more enjoyable – or at least a bit less unbearable. For my USA TODAY column, called “At the Airport“, I do a round-up of the best amenities rolled out by airports each year. 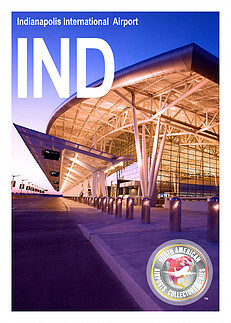 For 2017, celebrated perks included the 24-hour ‘microcinema’ at Portland International Airport, Pittsburgh International Airport’s introduction of “MyPITpass,” which allows the non-flying public to visit the secure side of the airport, and the opening of ROAM Fitness, an in-airport gym at Baltimore-Washington International Airport. The 2018 list of “Best Airport Amenities” is full of fresh new amenities and creative bonus activities. Airport restroom lines get long when users can’t tell which stalls are empty. To solve that problem, in April, Los Angeles International Airport debuted a pilot program in one set of Terminal 4 restrooms using Tooshlights’ smart latches on stall doors. When a door is closed, a light over the stall turns red; when the latch is open, the light turns green. The latches are paired with the Infax smart restroom technology, which tracks usage and real-time feedback to improve restroom cleaning schedules. In July, a set of restrooms at ATL got smart technology in a set of loos too. The list of airports welcoming therapy dogs into the terminals keeps expanding. In 2017 Denver International Airport for upping the ante by adding Xeli the cat to its Canine Airport Therapy Squad known as CATS. This year Louis Armstrong New Orleans International Airport raised the bar by scheduling weekly visits with baby alligators. What’s next? Airports say they’re the front doors to their cities. Louisville International Airport takes that to heart with HMSHost’s new Book & Bourbon Southern Kitchen, which features more than 85 bourbons and qualifies as an official stop on Kentucky’s Urban Bourbon Trail. Travelers can pick up a trail passport and get their first stamp before they leave the airport or top off their stamps on the way home. This year HMSHost also opened the Whiskey River restaurant and bar at Raleigh-Durham International Airport, offering music six days a week, a wall covered in belt buckles and a selfie-friendly stationary bull. In July, two Gameway video game entertainment lounges opened at Dallas-Fort Worth International Airport, by Gates B42 and E16. Each of the 36 gaming stations is equipped with a leather chair, an Xbox One loaded with 19 games, a 43” TV, noise cancelling headphones, charging ports and space to store luggage. For those who need to get work instead of play, Varidesk just launched a free, staffed co-working space at DFW (by Gate C12) with a conference table for meetings and 24 workstations outfitted with power hubs and adjustable standing desks. This year OTG expanded the gate areas where passengers use iPads to order food and drinks and At Your Gate joined Airport Sherpa in offering food delivery to passengers anywhere in the airports they serve. Airport Sherpa is still only at BWI Airport, but during 2018 At Your Gate began running food and drink orders to gates at both San Diego International and Newark Liberty International Airports. Self-service bag check offers convenience at the check-in counter, but in May remote bag drop off service was introduced at the car rental center at Tampa International Airport. Denver International Airport introduced the service in November and now allows travelers to drop their bags off at shuttle parking lots and the airport transit center. The drop off service is free, but airline bag fees still apply. Free drop off service is available to DEN passengers arriving at least 90 minutes before their flights and traveling domestically on Southwest, United, Delta and American Airlines. At DEN’s Pikes Peak and Mt. Ebert shuttle parking lots, personnel greet arriving cars, remove luggage from the car, check in passengers and print out boarding passes. Then passengers park and jump on the shuttle to the terminal. Phoenix Sky Harbor began offering a similar early bag drop service back in 2013, eventually extending it to the rental car center, but discontinued the program last year. In what we hope may signify a trend, Seattle-Tacoma International Airport ran a pilot program to allow the non-flying public to go beyond the security checkpoints. The SEA Visitor Pass pilot program worked much like the year-round, TSA-sanctioned “myPITpass” program that Pittsburgh International Airport debuted last year. At SEA, access hours were limited and visitors had to apply for a pass and go through the security checkpoint just like regular passengers. But once “in” the pass holders could shop, dine, check out the art and entertainment, accompany a loved one to the gate, or be there waiting when they get home. The new Concourse A expansion at Charlotte Douglas International Airport is home to “Interconnected,” a giant digital artwork made up of three hi-definition LED media walls measuring over 2,000 square feet. The largest public artwork of its kind in the country, the media walls display constantly changing abstract images derived from airport operations data, including flight arrivals and departures, baggage handling and ground transportation. Once again, our list of special events, pop-ups and cool ideas is long. In February, just in time for Valentine’s Day, a pop-up license bureau opened in the baggage claim at McCarran International Airport in Las Vegas to help lovebirds streamline the process of getting married in Sin City. Couples couldn’t get married at the airport but picking up the license at the airport meant they could skip stopping at longer line at the clerk’s office in town. This year New York’s LaGuardia Airport and Pittsburgh International Airport each welcomed their first artists-in-residence. PIT airport also introduced a 6-month pop-up of the do-it-yourself paint studio called Paint Monkey. And in March, to mark what would have been Fred Rogers’ 90th birthday and the issuing of a Mister Rogers Forever stamp, PIT Airport held an event that included red cardigan-wearing employees, complimentary red shoelaces and “You’re special, too” buttons, and a ‘Mister Rogers’ Neighborhood’ memory board. Also in March, San Antonio International Airport marked Dr. Seuss Day with an event that included airport and airline employees and passengers reading Dr. Seuss books to children. On April 1, Minneapolis-St. Paul International Airport raised eyebrows, and dashed some travelers’ hopes, with the April Fool’s Day announcement of an aircraft viewing area with an outdoor pool. In August, Philadelphia International Airport installed a short story dispenser in the airport’s Virtual Library in the D/E Connector. Kiosks users press a button to request a print-out (on eco-friendly paper) of a fiction story that can be read in one, three or five minutes. And we’re happy to report that Denver International Airport continues to make good use of the outdoor plaza between the terminal and the Westin hotel. A pop-up park, complete with native Colorado trees and plants, showed up in July, the “Beer Flights” beer garden returned in September (to coincide with worldwide Oktoberfest celebrations) and a free ice-skating rink, with free skate rentals, is open now through January 6, 2019. Here’s to a great 2019 filled with even more cool airport amenities! New York’s LaGuardia Airport is in the midst of an $8 billion makeover and the first 11 gates are now open in the state-of-the-art Terminal B. Airlines operating out of this new concourse include Air Canada, American Airlines, and Southwest Airlines. They’ll be joined by United Airlines in 2019. The space includes soaring ceilings, a colorful children’s play area, charging stations throughout the seating areas and a nursing room. The kids’ area has a 16-foot interactive display that allows users to design their own aircraft on a tablet and watch it come to life on a giant digital wall. Next to the kids area is an indoor green space with greenery, benches and plenty of natural light. A slection of New York-inspired food, beverage and retail offerings include a branch of toy store FAO Schwarz and dining options such as Shake Shack, La ChulaBar & Taqueria (Mexican taqueria), Osteria Fusco (Italian), Kingside Bar & Restaurant, Irving Fam Coffee Roasters and Five Boroughs Market. In-airport food and retail delivery service ‘At Your Gate’ is up and running in LGA Terminal B as well. The terminal also has an Air Canada Maple Leaf Lounge, with a United Club scheduled to open in 2019. Other retail offerings include independent bookseller McNally Jackson, Hudson, LaGuardia Dufry Duty Free Shops, Spa Here, M∙A∙C, and District Market, with specialty Made in Queens products. “You’re going to love the new LaGuardia Airport,” New York governor Andrew Cuomo said in a tweet. When it comes to travel, there are plenty of lists that claim to rank the best (and worst) airports, airlines, hotels, loyalty programs, etc. Some are created by experts in the field. Others are the results of surveys (some scientific, some not). And still other are created (somehow) by companies hoping to get their names mentioned in a story. Conde Nast surveys it well-traveled readers to put together its long list of travel bests each year. Any of your favorites on this list? Or any airports you think were robbed of a spot? What will the airport of the (near) future look like? I’ve got a story in the current issue of AFAR that lays out that scenario. Here are some of the highlights. Get ready for single-token travel. A facial scan and an initial look at your passport is already all you need at some airports. Food and merchandise comes to you, wherever you are in the airport. OTG’s tablet-centered ordering and grocery-style self-checkout lanes are expanding, as are app-powered mobile delivery services such as Airport Sherpa and At Your Gate, already on-duty at the Baltimore, San Diego and Newark airports. Lost luggage is a bummer. But more bags arrive as promised thanks to airports that employ tools such as radio frequency identification (RFID) tags and monitoring apps to track bags from the time they’re accepted at the airport to delivery at the bag claim. High-tech lighting systems guide travelers to open spaces in giant airport parking garages and direct home-bound passengers to lost cars. Airport restrooms are high-tech too, with occupied/unoccupied signals over the stalls and technology that alerts maintenance teams to lavs that need cleaning. Australia’s Brisbane International led the way by letting travelers pay for purchases with cryptocurrency. Amsterdam’s Schiphol Airport followed with kiosks that exchange leftover cash for Bitcoin. Count on airports, the first and last city stop for international visitors, to embrace digital currency as its popularity rises. Short-stay cocoon sleeping pods and microhotels from the likes of Minute Suites, Sleepbox Hotel, and Yotel offer weary passengers recharging rests inside terminals. For longer stays, look for more full-size airport-adjacent hotels, such as the InterContinental at Minneapolis−St. Paul Airport, opened in July, and the TWA Hotel at JFK International, due in 2019. No longer ‘just’ transportation nodes, airports are branching out with full-service grocery stores, medical facilities, movie theaters and entertainment centers. The observation deck at Incheon Airport’s new Terminal 2 offers virtual reality experiences, while Singapore’s Changi Airport 10-story Jewel complex (opening 2019) promises the world’s tallest indoor waterfall. As space travel and space tourism moves closer to reality, some airports plan to double as spaceports, so travelers can set out across an ocean – or out of this world. What features are you hoping pop up at the airport of the future?